A bus company may face prosecution after a blitz by Transport Safety Victoria (TSV) at Melbourne Airport in March. TSV manager, compliance and information Andrew Chlebica says that while the vast majority of operators and drivers are doing the right thing, there are some that continue to flout the law. "Overall the bus industry is a very compliant industry, it’s not often we encounter operators and drivers who don’t have the proper, up-to-date accreditation. "It is important for both operators and drivers to understand that there are two levels to this; there are separate accreditation requirements for the operator of the bus service and the driver. "Unfortunately in this case of the operator at Melbourne Airport, he had neither." "We use the three E’s approach, which is to educate, encourage and finally, to enforce," he says. "We have had only one prosecution so far, that was a New South Wales operator who operated a charter service in Victoria while not accredited and received a very large fine. "The penalty also included an adverse publicity order, so the consequences of not being accredited are not just financial but also reputational," Chlebica says. The maximum fine for operating without accreditation is $176,000. TSV is making its compliance presence felt, conducting regular operations at key spots across the state. "We have had 12 blitzes since July last year and there are more planned. 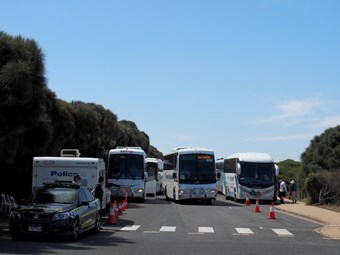 The bus compliance operations are conducted state-wide, not just in the Melbourne metropolitan area. "I do feel like the message is getting through, but there are some in the industry who have been slow to react. "This is not about punishing people, it’s about educating operators and drivers to realise that they have a responsibility to the public. "TSV has an obligation to remove any incentive for unfair commercial advantage that may be gained by operators contravening the requirements of the Bus Safety Act," Mr Chlebica said. TSV bus compliance officer Kennedy Kembo, who was present at the Melbourne Airport operation, says bus safety is a shared responsibility. "We are responsible for ensuring public safety, and so are the operators, and so are the drivers," he says. "So in reality, we are on the same team and working together on this." The TSV bus team has also been hosting a series of forums throughout Victoria. "The last one was conducted in Geelong in February and there is one planned in Wangaratta for March and Mildura in the next couple of months," Kembo says. "These forums are a good opportunity for us to get out in the community and answer questions about accreditation issues and other matters." TSV is concerned that there are still 400 deemed accredited operators who have yet to apply for accredited under the Bus Safety Act. From January 1 2016 those who are not accredited will forfeit their right to operate commercial bus services.